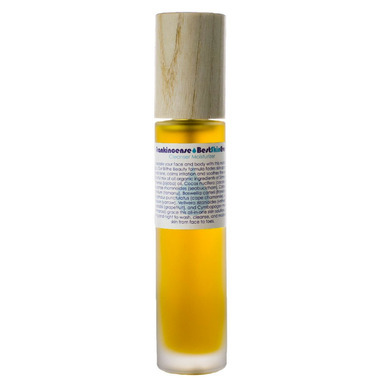 Consecrate your face and body Frankincense Best Skin Ever, a royal bathing attendant and sacred moisturizing mecca. Frankincense Best Skin Everٙ is an all-in-one cleanser, exfoliator, and moisturizer that blesses the face, revives the spirit, and sanctifies the moment. 1. Wet a small portion of a cloth with water. 2. Apply one to two squirts of any of the Best Skin Evers (Seabuckthorn, Sandalwood, Rose, Frankincense, or Neroli), to the dampened portion of the face cloth. 3. Gently massage the face, neck and back of the neck with the moistened cloth. Wash gently or wash vigorously for a deeper exfoliating effect. Rinsing the face is optional. Natural, Organic, Vegan, Gluten Free, Fair Trade, Non-GMO, Peanut Free Facility, Peanut Free Product.